With an ever increasing energy crisis occurring in the world it will be important to investigate alternative methods of generating power other than fossil fuels. Wind energy is an abundant resource in comparison with other renewable resources. The case study refers to the evaluation of wind turbine performance using a Computational Fluid Dynamics (CFD) approach. Standard wind turbine designs are considered for this UberCloud experiment and the CFD models were generated in the Workbench environment. 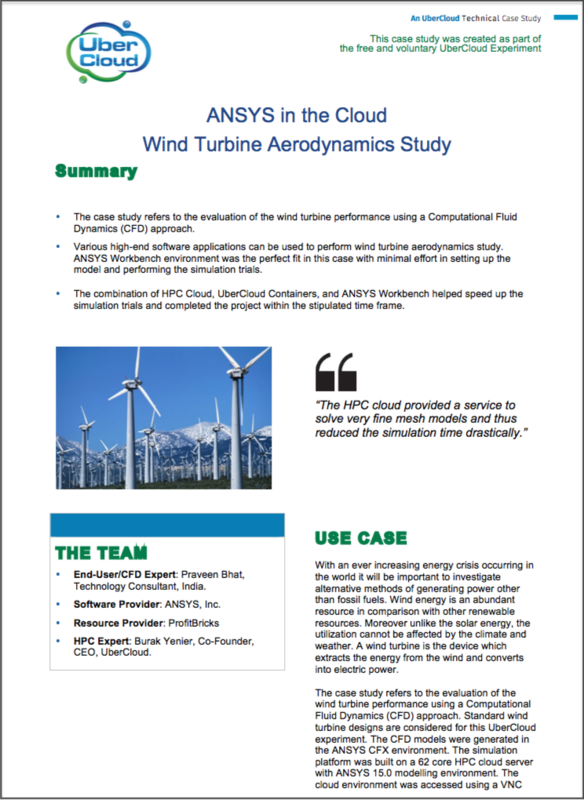 The evaluation of the wind turbine performance using ANSYS Cloud accessed remotely, requiring only a web browser from the user. ANSYS Workbench environment was the perfect fit in this case with minimal effort in setting up the model and performing the simulation trials. The combination of HPC Cloud, UberCloud Containers, and ANSYS Workbench helped speed up the simulation trials and completed the project within the stipulated time frame.